I try not to dive too deep into the technical side of Content Strategy, but I have noticed that many companies don’t use links to their full potential in their online marketing strategy. I am not sure if this is because links are looked at as a detail that can be overlooked, or the power of a link is not understood. Links are an intricate part of any online marketing strategy. 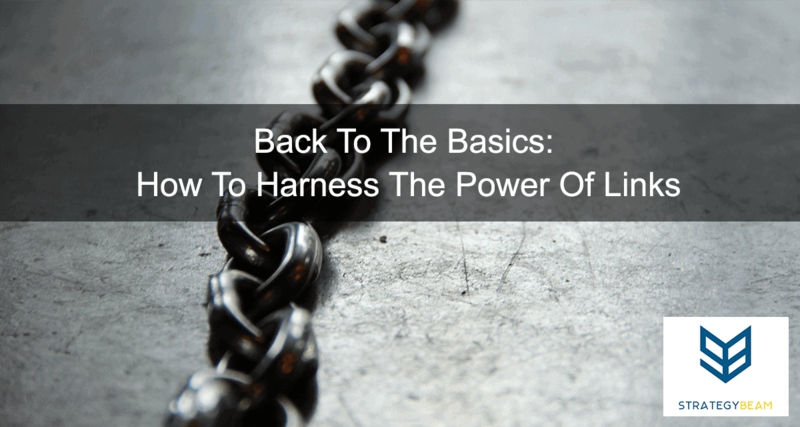 With all the hype around social media, email marketing, and PPC, it is easy to forget the basics and overlook the power of links. There is a lot of technical information about the importance of links and how they work. However, the most important thing is that links help connect your content for Search Engines along with your readers. This means that your business will see better user engagement plus Search Engines can find your content quickly. Links help lift your online presence. This means that Search Engines will place a higher value on your website and content. The higher Search Engines value your site; the easier your website is found. The easier your website is to find means the more visitors and potential sales for your business. More visitors equal higher conversions and more sales. Makes sense, right? There are several types of links, and each kind of link carries different levels of importance by Search Engines. A few of the most important links to know about are internal links, inbound links, and external links. Internal Links: Show Search Engines how your site is connected. These links help spiders crawl your website and report your content to Search Engines quickly. Inbound Links: These links point to your site from an external website. These links help build authority for your site because Search Engines connect the referring site to yours. External links are essential for making your domain authority and improve ratings in Google. Outbound Links: Outbound links are links that point from your website to other websites. These links are great for referencing material or providing more information for your reader. Outbound links help Search Engines understand your content, and they increase authority (but not as much as inbound links). Keywords play a significant role in Search Engine rankings, and you already know why Search Engines use keywords to understand the content of your website. But did you know that keywords also help your links and by using keywords in your links you help Search Engines understand your content even more? You provide excellent information to Search Engines when you include keywords in the Anchor Text of your links. Keywords in your links tell Search Engines about the page your link is on, the page it is linking to, and the connection between the two pages. Using generic terms like “Click Here” in your Anchor Text can actually hurt your digital content and confuse Search Engines. A few links on each page of your business website that have good keywords is much better than having a lot of links that don’t use the keyword. This is because the power of a link is multiplied when you use keywords in the Anchor Text, and the result is in a page that performs better. There is a lot of debate about what makes the “perfect ring.” The reason this is an important issue is because you want to get the most “juice” out of each link, so Search Engines grab onto your website. We will dive into the finer details in a future post, but for now, let’s take a look at the anatomy of a great internal link. The link is found on a trusted site. Many agree that .edu or .gov domains carry high authority. Within a paragraph. The amount and type of material surrounding a relationship has an impact on how Search Engines evaluate each link, but a variety of content is good. As you can see, there are a lot of variables that go into maximizing the impact a link has on your content for your business. While talking about links may not seem like a big deal, links have a substantial impact on your digital marketing strategy and most important of all – your bottom line. Take full advantage of links so you can dominate your market and reach your audience! Now it’s your turn. What ways do you use links to boost your digital marketing and grow your business? Let us know in the comments below!